White and black Crelander is a recent release, great quality, innovative and intuitive electric personal outdoor transporter, balance board or smart two wheel self balancing scooter for an easy and effortless riding experience with a maximum speed limit of 10 miles per hour (but our guess should be more like 6 mph with these units in practice, which is roughly equal to 10kmph and does feel faster than it sounds when you’re on it), 9 inch tires and LED lighting. It has a 36V/4.4Ah lithium ion battery and the charger voltage is specified at 100 to 240 Volts / 50-60Hz. Crelander weighs 27 pounds with measurements of 584 x 186 x 178 mm and can carry a maximum weight of 220 pounds which is quite all right- which means it covers heavy individuals too. The learning curve is reported to be very short on this unit with customers picking it up often in just a few minutes and you should be able to use it out and about just ten fifteen minutes after that. It is suitable for use by anyone that wants to ride it daily for getting from one place to another or exploring outdoors and having a lot of fun while doing it. 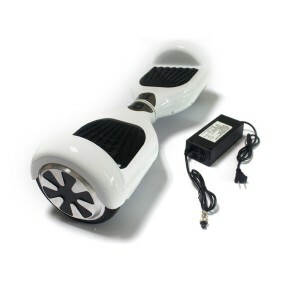 It is easy to learn how to keep it in balance and you accelerate it by just putting gentle pressure at the front with your feet as it comes with two built-in 12V motors that are located in the wheels and that drive this cool unit and you can use both of your feet separately to rotate it, do easy turns, accelerate it and break smoothly and it can climb at a maximum of 15 degrees. IP56 waterproof rating means the balance board is protected from increased pressure water jets from different directions and is OK to use in light rain without problems but you still shouldn’t use it under heavy rain. Smart or intuitive means it responds quickly to the pressure of your feet to turn, break smoothly, rotate or accelerate with its responsive sensors inside the foot panels and you can do all that right on the spot. It should go for an easy 10 to 12 miles on a single charge and the full charge takes a bit more than a couple of hours. 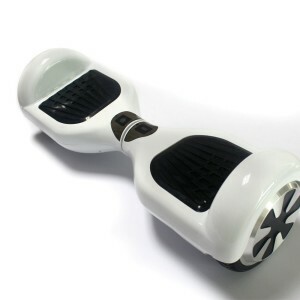 Like pretty much all the other balancing scooters, this is also a made in China product but it is reported to be a decent quality sturdy product that should last you quite some time if you take good care and the most important thing is it really is a lot of fun (is not a skateboard but feels like a sideways skateboard) which is the main reason why these units are becoming so popular. The item reviewed on this page has a great price and do not think that you’ll get a better scooter when you pay twice or up to three times more as they are basically the same unit with different colours and slightly different designs.